In order to increase the effectiveness of the material supplied here, Holisticonline.com has developed several diagnostic tests. These tests incorporate artificial intelligence. Four tests are supplied - two for determining your mind-body constitution (Prakruti) and two for determining your current condition (vikruti). The tests are designed in such a way that you can take part of it if you are in a hurry to get a quick, but may not be accurate, read on the results; and then can improve the accuracy by taking the entire test. Some questions may not be very clear. If you don't understand the question or don't know the answer, just skip the question rather than guessing. Our tests are designed to normalize your scores. In order to determine your Prakruti, answer the questions, based on how you had been in your lifetime (not necessarily now.) Remember, you are trying to define your basic constitution here; think about the instances when you were very healthy and happy. Then answer the question based on that time. Note down the results given by the system as your Prakruti. Let us say for arguments sake, it is Vata 60, Pitta 30 and Kapha 10. You are a Vata person with Pitta as your secondary dosha. Now take the test for Vikruti. 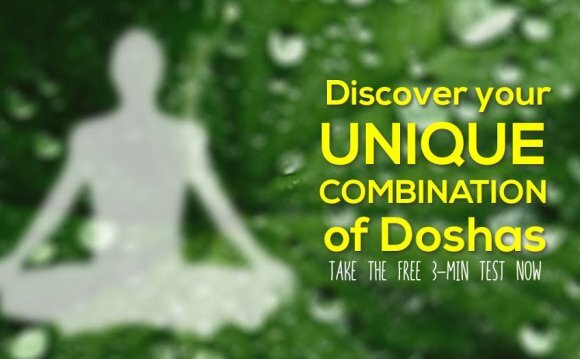 This test concentrates on determining your dosha imbalance. You should answer the questions based on your condition now. This will answer the question, what's out of balance that needs stabilizing? Take this part of the test once now and then again every three months to monitor your progress. When determining your vikruti, identify your problem areas by focusing on symptoms that are occurring now or that have occurred consistently within the last two weeks. The result will give your Vikruti. In the example above, let us say the person got a Vikruti score of Vata 40, Pitta 30 and Kapha 30. Now you can see the imbalance. You Vata is off 10 points, and hence it needs to be balanced. So, the treatment strategy will be to pacify your vata. Dietary intervention may be one of the prescriptions. Ayurvedic practitioners have a wealth of foods, medicines, herbs and other techniques (such as yoga, meditation, aromatherapy etc.) to accomplish this. Look at the section six steps to get back to good health. We will cover the effect of diet and the six senses on the tridosha later.